Last week both the Democrat & Republican wings of the one Big Government Party were @ it again – this time pandering to students 18 years old & older re lowering student loan interest rates. The first problem for Republicans is that BO has once again set the agenda – this time calling for a freeze @ 3.4% interest on federally subsidized student loans. Of course shortly thereafter Mitt Romney followed along like a little puppy & was only too quick to also approve BO's plan @ a cost to taxpayers of $6 billion. The interest rate is scheduled to double to 6.8% on July 1 if Congress does not follow BO's call that would extend or freeze the 3.4% rate for one additional year. Now who believes this new subsidy will not become permanent – who will go first - Republicans or Democrats - to call for the current 3.4% rate to increase next year? What will be different then? In fact what is different for Mitt now? Earlier this year Mitt praised Paul Ryan's GOP budget plan, approved by the House, that allowed the student loan interest rate to return to 6.8% on July 1. Just another Romney flip flop. Complicating matters for the GOP is that House Republicans wanting to remain true to their presumptive nominee have also backed the student loan interest rate freeze – again going against their own budget plan previously voted for. On Friday House Republicans voted 202 to 30 to freeze the 3.4% rate for another year. Notable among the 30 who showed financial responsibility were as always Jeff Flake & Trent Franks both of AZ, & I'm delighted to say Rob Woodall of GA – all FairTax supporters. Those of us involved in improving higher education in America (actually I would first settle just to not have it deteriorate further) know that tuition has risen faster than general inflation for decades. The student loan subsidies are the main reasons why. As the universities realize that more & more government money is being provided for education they naturally raise tuition. 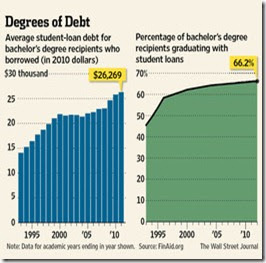 Student loan debt is now greater than the combined credit card debt of all Americans. Our youth leave college with thousands of dollars in student loan debt (see above graph) & poor employment prospects – the unemployment rate of people 20 to 24 is 13%. With all of this in mind even huge Romney supporter Larry Kudlow, on his Saturday NYC radio program, could not support Mitt's pandering on this one. Mitt could have made a difference on this issue by forcibly showing how he would stop & then reverse the student loan scourge that has indebted our youth to thousands of dollars of loans while subjecting them to little chance of gainful employment after graduation in fields that no employer has use for. America needs an inspirational leader who points out how the education system in America must change so that students first take into account the demand for people who graduate in their chosen field & then understand what the expected salary & standard of living will be – for instance graduating petroleum engineers this spring start for an average of $120,000 per year. There is something to shoot for – being 22 years old with an engineering degree & making $120,000 per year to start. The right leader could explain that the student loan program is the root cause of the problem of why schools raise tuition faster than inflation & why he is, for a start, letting the program go back to less generous years of subsidy beginning with the return to the 6.8% interest rate on July 1. It would have been reinforcing had he pointed out that student loan checks are issued by the Department of Education – a Department he plans to eliminate if elected President? The student loan problem is another long slog in the mindset change that is needed - but you can't get started sooner than today & we missed this chance with Mitt. This issue highlights that the Republicans are putting forth a presidential candidate who takes the same position as BO on student loans, signed a state government healthcare law that ObamaCare is modeled after, puts even a $50,000 lower threshold on eliminating taxes on interest, dividends, & capital gains than BO does – $200,000 for Mitt & $250,000 for BO for couples, & wants to means test Social Security benefits as further evidence he too is like BO wanting millionaires & billionaires to pay their fair share of taxes as if they don't already. This from a candidate who says he knows how to grow the economy - oh please. And this does not begin to mention the political flip flops over the past eighteen years on virtually every other issue. Just when I thought that McCain was the worst presidential candidate I had ever seen along comes Mitt Romney & the Republicans are going to put him up as their nominee. Good luck with that whether Mitt wins or loses. Thanks to IBD for publishing the above graph & Bill O'Reilly for his April 23 FNC Talking Points Memo (below) – both of which confirm the points made in the February blog posting entitled Evidence Shows November Election Only Important To Some. 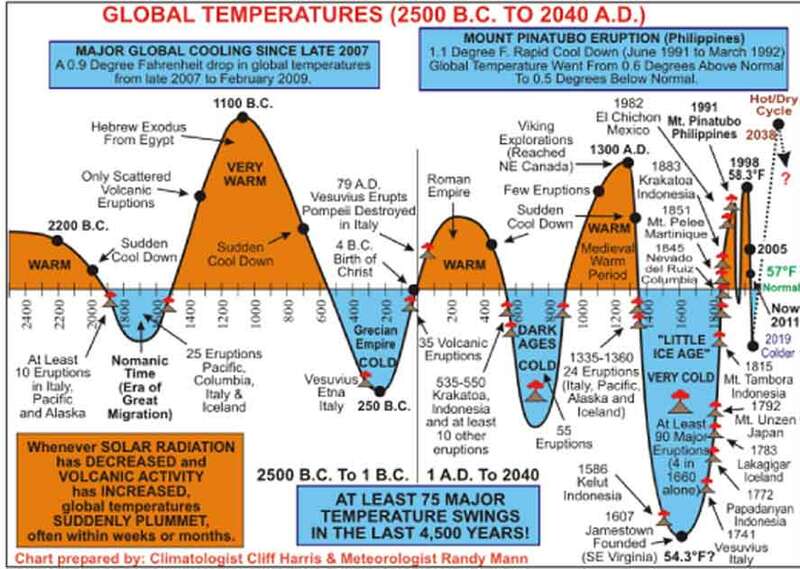 Discerning readers of the graph, memo, & blog posting realize that the November presidential election is not about the Arab world, the budget deficit or national debt, the creation of jobs, China's military build up, Iran's uranium enrichment, Venezuela, the price of gasoline, or even Dubya. Don't be fooled by TV talking-heads, who support the two party system – whatever the outcome of the election, who pretend that it is about the aforementioned issues & the swing of the majority of the detestable Independent voters. The election is about how many of the 150 million Americans who live in households that receive some kind of government assistance can comprehend that the government programs they have become dependent upon are not sustainable & whether or not they can dare great enough to help turn this mindset around. The deterioration of the work ethic that has torn the heart out of the people who only know living on government checks each month, a point that Bill's memo does not even mention, is even more dangerous than the memo's statistics themselves illustrate. The choice regarding creating wealth or redistributing wealth is really a choice between prosperity or poverty for America. This is what the election is all about. We are about to give you some amazing stats about America becoming a welfare state. During the last two years the feds have spent more than $1 trillion on programs to help poor Americans. Most of that money goes to direct assistance - Medicaid, food stamps, child care, nutrition, things like that. Since 1970, means-tested entitlements have increased by an unbelievable 5,500% and right now an astounding 150 million Americans live in households that receive some kind of government assistance. There is no question that the feds and states have loosened standards under which Americans receive entitlements. Since President Obama has been in office, federal welfare spending is up about 41%; food stamps are up about 135% since 2007; disability payments are up 116% from a decade ago. Those who advocate cutting entitlements or making it more difficult to receive them will be immediately branded as 'bad people.' Just for telling you this I'll be labeled a horrible guy. But what's worse? A bad economy for all Americans and a $16-trillion debt, or a responsible entitlement agenda that gets spending under control? All sane people know that safety nets are needed, but when standards are so lax that the system becomes easy to game you know you have a problem. And we do. Earlier tonight I sent a detailed report thanking everyone in NJ who participated in the subject project this year. 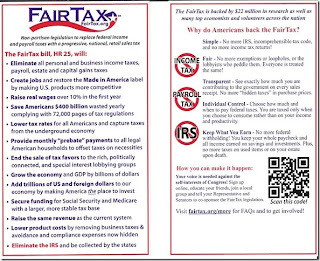 As usual I found that passing out FairTax pocket cards @ post offices on or around tax filing day reaches the most fertile group of people possible regarding being favorably disposed toward the FairTax. It is not easy work participating in these events but it is oh so rewarding. One man in Somerville told me he had just mailed an envelope to the IRS containing a check for over $3,000 – he said he doesn't know what "they" do with the money. Several other people told me similar stories. What does this tell you? What should those of us who know better being doing? The final tally for 2012 in NJ is 1,597 FairTax pocket cards being handed out @ post offices (there is one more PO captain I have not heard from). This brings the total number of FairTax pocket cards handed out in NJ, from the post office project alone, to over 11,500 since the project's inception. I am humbled by everyone's effort & support & can only say thank you by letting you know of my sincere appreciation of your work & friendship. It is outstanding. 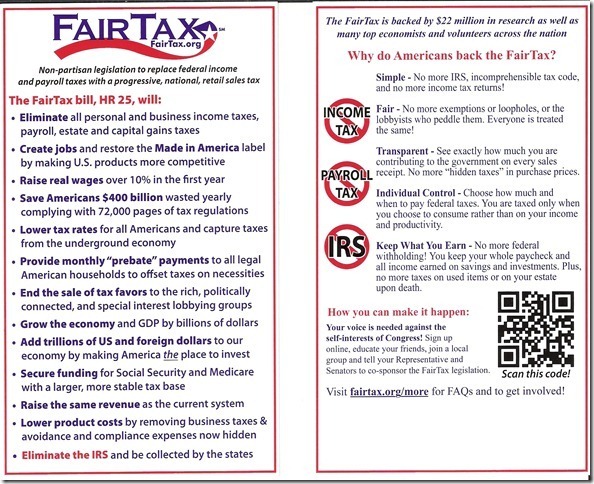 Below is a copy of both sides of the new FairTax pocket card recently updated by FairTax national in Houston. I used this version in the Somerville Post Office event. Please let me know if you would like to secure a supply of this card for your own activities. 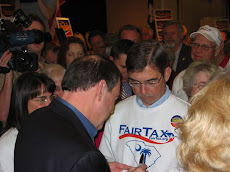 The next six months of 2012 is very timely in educating our fellow citizens about the most important piece of legislation in our lifetime for America – The FairTax Act of 2011. Please click on the following link for a very insightful analysis of the federal budget (not the one the Senate led by Ringside Reid has not passed for over three years). This analysis provides a specific depiction of where your income tax money goes to work against you. It is widely known that BO is expected to raise & spend $1 billion for his reelection campaign. The aforementioned analysis shows this amount of money is chump change compared to what is really happening. The video explains that in round numbers for every ten dollars the government spends it taxes for six dollars & borrows four dollars. It takes four dollars to buy the things that actually make up the federal government – like buildings & people to run the various programs - meaning that six out of every ten dollars in the federal budget goes for entitlement programs to buy votes – this is the Death of Democracy I have written about for years. BO's one billion dollars is just the amount of money he has to tell the takers about all of the giveaways he has in mind. The first graph above shows nearly half of Americans do not pay federal income taxes. The percentage of people who do not pay federal income taxes, and who are not claimed as dependents by someone who does pay them, jumped from 14.8 percent in 1984 to 49.5 percent in 2009. The Heritage Foundation reports that 151.7 million Americans paid nothing in 2009 & by comparison, 34.8 million tax filers paid no taxes in 1984 – why didn't we recognize this coming problem in 1984 with all of the warnings from our Founders? This is the way politicians wanted it & a sound asleep electorate let it happen. Carol correctly points out that President Reagan merely slowed government giveaway programs – check both graphs for yourself to see the momentum (mass times velocity in physics terms) working against him & that still works against us today. The second graph indicates that more than seventy percent of federal spending goes to dependence programs (housing, food, income, student aid as examples). More than 15 times the resources were committed to paying for people who depend on government in 2010 than in 1962. Source – The Heritage Foundation. In summary, it is obvious that little or nothing is paid for government programs by the people who receive the benefits meaning these people are voting to spend others peoples' money (redistribution of wealth). Since the great majority of people highlighted above have no immediate incentive obvious to them for helping America move forward it is reasonable to figure they never consider that the current tax & spend system cannot continue as is. Never mind that they don't realize they are currently paying embedded taxes on every good or service they buy plus for workers Social Security & Medicare entitlement taxes of 7.65% out of their wages & another 7.65% out of their productivity-output. Some in the 70% group who file an income tax return (& in virtually all cases pay a preparer or buy software to handle the filing) may receive some of these entitlement taxes back in the form of the Earned Income Tax Credit now known as the EIC. The current tax system is not sustainable as is - it is going to have to change with or without the FairTax or the country will change most likely for the worst for the aforementioned people & worse yet for all of the rest of us. 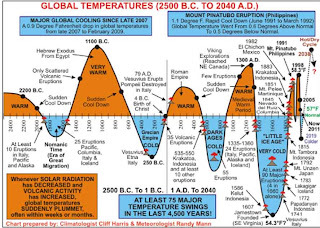 Everyone will sooner or later realize that all of our children and grandchildren (not to mention all of us if BO is reelected) will be harmed if we continue on the path we are currently traveling. The needed mindset change could not be clearer for the small minority of people who do not need to fall down a flight of stairs to know they will be hurt when they reach the bottom. 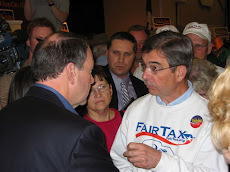 As tax filing day approaches make sure you are doing everything you can to support & elect people who will pass the FairTax – the best mindset changer I know of to reverse the terrible path we are on. With regard to the November election the horrifying numbers in the posting below & the chart above make me so glad that we started early to find open-minded statists & more importantly convince them that America is on an unsustainable path that kills for all mankind the goose that laid the golden egg. Finding such statists is not easy & converting them may be an even more difficult task but thanks to everyone who has let me know they are trying – some with good success. If everyone works & converts three such statists before the November election we may have a chance going forward to overcome the numbers in this posting. Without such an effort the results of the election will most likely continue us down the socialist road of deterioration. Now I am not talking about conversions only @ the presidential level but @ any level in every state, county, or town where inspirational candidates are in play. For instance our Night Watchman recently sent me this note – "A point of interest...Eric Klingemann, running for Congress in Texas...he claims to be a FairTaxer. GOOOH | Get Out of Our House: A plan to replace career politicians." GOOOH is an organization previously presented on this blog that we can't afford not to check out along with Mr. Klingemann as an example. Back him to the hilt if he passes your tests to be part of the bedrock we need. My quick Google search revealed Mr. Klingemann is a graduate of West Point – BS in Aerospace Engineering, MBA, small business owner since 2003, & FairTax supporter who quotes paragraphs of FairTax: The Truth on his issues page. Mr. Klingemann's website includes "Our $15 Trillion in debt was brought to us by Republicans, while they controlled the House, Senate, and Presidency." Now just how happy do you think this will make him with the establishment Republican Party? This is the type of credentials we need for candidates as a start if we are to return to the excellence of our founding. If you follow this approach, for credibility sake, it is important to endorse only people who have a believable consistent record of accomplishment that you can point to – not politicians like Mitt, Rick, or Newt who come with so much baggage that you risk losing people you talk to quickly if you present any of them as the answer to our problems. As most of you know I (& many of you for that matter) have just about written off the presidential race to BO because of the current three rotten GOP candidates who will only get us in deeper should any of them win thereby making it that much harder to defeat someone like Hillary in 2016. We need a real strong base in place like people profiled on GOOOH.. The numbers on the above chart demonstrate what establishment Republican strategists Karl Rove & Jeb Bush have been saying for years – namely, GOP candidates will need significant support from Latino voters to have any chance @ all in presidential elections. The Latino support for GOP presidential candidates has gone down from 2004 to 2012 as the number of Hispanic voters has increased – a deadly combination for BO's opponent. Please note the above chart is of likely Hispanic voters – not registered or possible voters. I distinguish between the terms "Latino" & "Hispanic" in this posting - Latino means a native of Latin America (Mexico & south) & Hispanic, being a broader term, meaning relating to the people, speech, or culture of Spain, Spain & Portugal, or Latin America. Jason Riley (who specializes on immigration issues as well as with his wife Naomi on higher education issues) reports that data from the non-partisan Pew Hispanic Center supports the above position in that the nation's Hispanic population grew in nearly every county between 2000 & 2010. There will be 2.3 million more likely Latino voters in 2012 than voted in 2008. The ten states with the largest Hispanic populations are California, Texas, Florida, New York, Illinois, Arizona, New Jersey, Colorado, New Mexico, & Georgia. Now some of these states are reliably BO supporting states regardless of the percent of Hispanic voters but some are certainly not also. I wouldn't want to start an election by conceding all ten of these states every time – it is bad enough conceding CA, IL, NY, NJ, & the rest of the northeast. Mr. Riley further reports that Hispanics are one in six U.S. citizens & one in four of the babies born in the U.S. GW Bush won Nevada, New Mexico, Colorado, & Florida in both 2000 & 2004 but BO won all four of these states in 2008 & they may never look back. Just ask yourself how many Hispanic voters Mitt Romney endeared himself to as he hardened his anti-immigration position pretending to be a conservative over the past few months – the answer is 14% of likely Hispanic voters. Please click here to hear reporter Laura Meckler discuss her front page WSJ article from earlier this week on this topic. 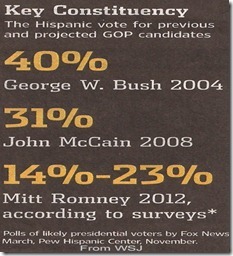 But it is not the Hispanic vote that worries me the most. I have reported on the low turnouts in the Republican primaries all winter & this did not change in MD or WI on Tuesday. Voter turnout in MD was 18% & in WI it was 23% where it had been expected to be 35%. My concern, as it has been since 2004, is the fact there are between seventy five million to one hundred million people eligible to vote who do not vote for one reason or another. Let's just estimate that 30% of these people are principled knowledgeable voters who are turned off by the rotten choices we have again this year. Now who do you think the other 70% will vote for if they meet the community organizer who promises their problems will be taken care of by millionaires & billionaires if only they vote for him – not a pretty picture is it? All of the above information shows why we need our own get out the vote campaign as described above as well as in other postings. It is a lot easier to go to rallies where we deceive ourselves about our electoral power with like minded people but preaching to the choir will not defeat BO. It is much harder to subject yourself to work on statists – but the reward, if successful, will be worth the effort. Thanks to our SC businessman for sending us Senator Jim DeMint's write up from National Review Online re BO’s recent open mic gaffe. Please notice the body language of both BO & Medvedev after the exchange of words. It is even more telling than the actual words spoken in revealing BO's deceit – something readers of this blog have long known. As you may have heard, earlier this week President Obama was caught on an open mike asking outgoing Russian President Dmitry Medvedev, and by extension, President-elect Vladimir Putin, for "space" on "on all these issues, but particularly missile defense" because "after my election I have more flexibility." The scandal isn't really the embarrassing gaffe itself — or the equally embarrassing subsequent endorsement of his reelection by Pravda — but the true substance behind it. After all, the character of the president's words was nothing new. President Obama has been caught before voicing his condescending contempt for his constitutional accountability to an American public he clearly sees as an obstacle to progress. The moment with Medvedev was a bit rushed, but had he more time, no doubt the president might have gone on at length about Americans clinging to our guns and religion, our 72-degree thermostats, how our doctors perform unnecessary surgeries on unsuspecting patients, how our law-enforcement officers often act "stupidly," and how much easier life would be if he were a dictator like the president of China. The president says he looks forward to greater flexibility in a second term. What the president misunderstands — or perhaps, simply dislikes — is that under our Constitution, the president is not supposed to feel especially flexible: That's the whole point of a limited government. James Madison made clear in the debates of the Constitutional Convention and in the Federalist Papers that federal officials — especially those of an activist bent — are supposed to feel very, very constrained. In a constitutional republic, the government's freedom is constrained by the people, to protect us from things being other way around. And even more to the point, what exactly does the president think he needs "flexibility" to do? In the last three years, Barack Obama has added more money to the national debt than any president in history. He has run three consecutive trillion-dollar deficits, the first three the world has ever seen. His signature domestic policy achievement was an unprecedented, unconstitutional power grab that may soon be struck down by the Supreme Court. He engineered or oversaw unprecedented federal takeovers of the American auto industry, our financial system, our home mortgage industry, the health-care system, the student-loan industry, and the education system, and attempted a takeover of the energy system. He has run the federal government without a budget for three years. In foreign policy, he appeased anti-American rivals by undermining democratic allies in Israel, Honduras, and Eastern Europe. This record, breathtaking in its hubris and scope, has been the work of Barack Obama, constrained. What could he possibly have in mind if given the "flexibility" that comes with a second term? Ending missile defense? Sounds like it. Middle-class tax hikes? They're already scheduled. ObamaCare II? Stimulus III? Cap-and-Trade Redux? Amnesty? What will it mean for Russia's neighbors? For Israel? For gasoline prices? For gay marriage? For religious liberty? For Iranian nukes? For the budget? For the strength of the dollar? What even comes after trillion? President Obama has, in word and deed, spent three years making clear that he brooks no formal limitation on his executive power. His only limiting principle, if you can even call it that, has been public opinion — "my election," as he put it to Medvedev. Once reelected, finally loosed from even that informal, self-imposed check on his ambition, what would the suddenly "flexible" President Obama suddenly believe himself free to do? Of course, the president himself moved quickly to clarify his comments to Medvedev, promising that he didn't mean what he clearly meant. Apparently, he wants us to believe his intent is to mislead the Russians, not the American people. But then again, this is the same man who once promised a "net cut" in federal spending, said he opposed the individual health-care mandate, promised to close Guantanamo, promised if you liked your health care you could keep it, promised that conscience rights would be protected under ObamaCare, and on and on. The president's open-mike gaffe does not prove anything we didn't already know. Mr. Obama does not feel bound either by his own past words or the Constitution — only by the stubborn, retrograde political ideas of the benighted voters he needs to fool in order to win his second, liberated, term. Barack Obama may not be the first American president to look down on his countrymen, but he seems at least to be the worst at trying to hide it. The chilling question is: What happens if he wins a second term, and no longer has to try? — Jim DeMint is a Republican senator from South Carolina.